THE NITROGEN (N) PART II A: Forms of assimilation; The nitrate (NO3-). Nitrogen is absorbed mainly in the form of nitrate (NO3-). The nitric form is preferred by vegetables. It is performed in an active way, with consumption of ATP (energy), being inhibited by the low temperatures. The absorption of the nitrate alkalinizes the environment, reason why it is produced better in slightly acid terrains. The plant processes nitrate by means of reductases to the ammonium form (NH4 +), which then goes into the amide form, the glutamine is synthesized, which gives rise to amino acids and, these, to proteins. 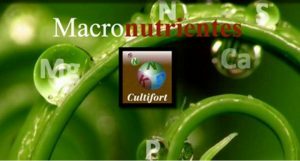 For nitrate reductases to work, it is necessary to the molybdenum (Mo) (Https://www.cultifort.com/Espanol/eccultifmob.html), so that a plant malnourished in molybdenum will not be able to process nitrate; So that the plant could be in excess of nitrate, although it would show symptoms of nitrogen deficiency, when it could not process it.